Just in case this is your first reading of Coop’s Corner, a word of advice: If you are not interested in learning the myriad ways you can get involved with introducing teenagers (and younger) to sailing on something with an interior, a head, a galley and bunks, aka a Big Boat, skip this column. If you think this is a good and worthwhile thing to be doing, read on. Reflect on this list of boats for a minute if you will. How many teenage kids have the opportunity to get onboard a Class40 (OK, outside the Atlantic Cup), let alone do a race on a Class40…against another Class40 to boot? Actually there were five Class40s racing, although the other three raced doublehanded with adult crews. I am the Youth Coordinator for the Ida Lewis Distance Race, so inquiries about getting kids on boats route through me. Like many things, a new idea often takes time to grow roots, let alone sprout buds. 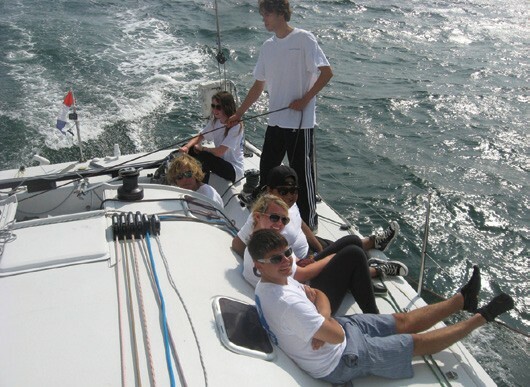 Historically, I have printed fliers advertising the Storm Trysail Foundation’s Junior Safety-at-Sea seminars and the Ida race and visited Sail Newport during Opti and 420 regattas, papering the parking lot and going boat-to-boat, handing them to the kids, parents and coaches. That’s a really hard way to get the word out. Then there are emails to my own kids (well, I think of them as my kids), the Prout School Sailing Team, seven of whom were aboard Icarus. This involves emails to the sailors and their parents, postings to the team’s Facebook page and to my own page, since I am “friends” with several of them outside the team’s page…and texting. And sometimes I call a couple of the team’s primary instigators and ask them to spread the word. There are also emails to the coaches of the other Narragansett Bay schools we sail against, plus one to the New England Schools Sailing Association (NESSA). So, for the first few years of the Youth Challenge, I had to be hectoring the kids I know even up to August, about going for a sail in the race. This year it was a bit different. The Youth Challenge appears to have taken root and sprouted some buds. I had my first inquiry from a junior sailor (not his parents) in May, and several in June, which is an absolute record. And far from the adults doing all the organizing, this year a Youth Challenge crew was put together by one of the kids. Trevor Davidson, a Newport Water Rat (Junior division), has been sailing on a J/111 this season and he recruited his own team of local junior sailors to do “The Ida” on the J/111. And far from “just taking the kids for a sail,” this team was out practicing several times this season. I know about half of Trevor’s crew, and it was no surprise to me when they won the Youth Challenge trophy. And separate from the Youth Challenge, several boats brought young sailors, either as part of or in addition to the regular crew. This is very encouraging to me. It means that all the jumping up and down I have been doing and the column inches I’ve written over the past lord knows how long are finally paying off. Now, if you think having more kids in, on and around big boats is a good idea and worthwhile thing to do, then from here is where you need to pay attention because this is how (one way) to do it and what might happen along the way. None of this need be yacht club-centric, by the way. It’s just that “yacht club” is still how the bulk of the sailing population operates and is by and large the venue for junior sailors to be in the summer. The first thing you need is to get some like-minded mates on board, for two reasons: You cannot do it all alone, trust me, and variety of boats is a good thing. Let’s say you have identified owners you know who are willing to bring juniors out sailing…and it does not have to be a race. In fact, if it’s not a race then the kids can learn more, (and have more fun), the adults can spend more time helping the kids, and there is less stress across the board. Next, you will, ideally through your club or community sailing center, have the Storm Trysail Foundation help you set up and run a Junior Safety-at-Sea seminar. This will help get novice kids used to simply being on a big boat, not to mention the essential skills they will learn during the day. Now, and this is the important part, remember Peter Pan’s most famous quote? Well, it is “I don’t want to grow up.” (If your wife or parents occasionally admonish you to grow up, you are a prime candidate for this kind of work.) Write this quote down and epoxy it to the bulkhead. If you have teenagers yourself, just use regular Elmer’s glue, cuz you are already halfway there. Having kids on your boat and seeing them “get it” is great, but it takes some patience and a sense of humor. You in fact have to a) start thinking like a teenager, and b) whatever happens, just laugh. So, if your kids are late to the boat, don’t have the right kit after 15 emails and text messages, forgot their water bottle, went to the Blue Bay Marina instead of the Blue Bay Yacht Club, don’t have any sunscreen, show up wearing flip-flops, not shoes, or just forgot (…and the list goes on), keeping your sense of humor is paramount. Personally, I use this kind of interaction with kids to help me get to my Happy Place by practicing deep breathing and reflecting on the ultimate goal of the exercise: Getting kids hooked on sailing in the same way I was.